It's BLOG CANDY time! Yes, you can win all of this by just leaving me a comment on this post. 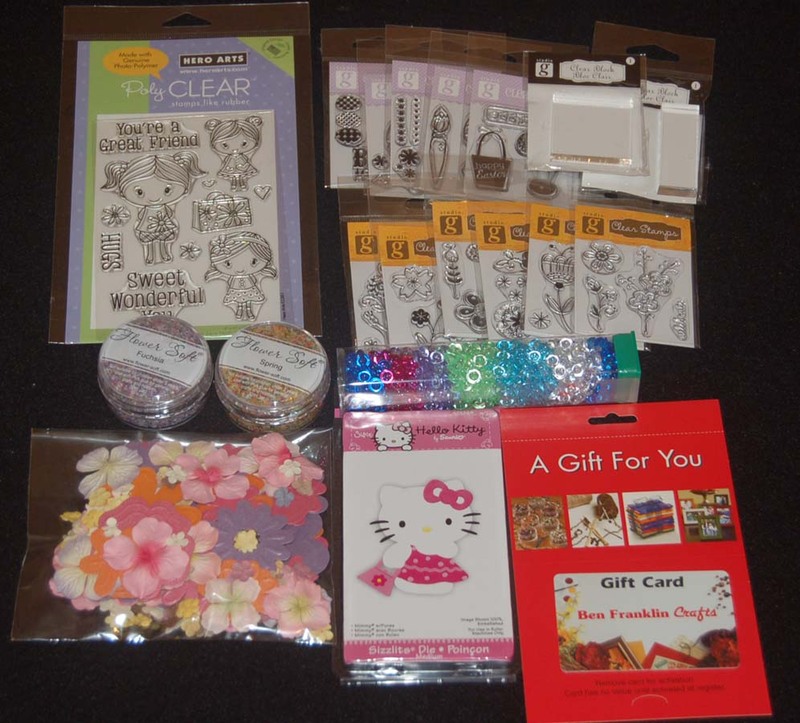 The prizes include lots of clear stamps and two acrylic blocks, a Hello Kitty Sizzlet, two containers of Flower Soft, a bag of assorted flowers, acrylic dew drops, and a FIFTY DOLLAR Ben Franklin Crafts gift card. In your comment tell me what kind of products you'd like to see for sale at Ben Franklin Crafts. I will randomly select one name from all the comments sent in. Please enter only one time and leave a identifiable name (not 'anonymous'). Your comment must be received by midnight on April 3, 2010. I will announce the winner on Easter Sunday (April 4th). You will need to send us your mailing address if you win. Good Luck to all! I was shopping for Easter punches and rubber stamps when I was told that I was getting a late start. It wasn't until I got home and looked at a calendar that I realized that Easter is on April 4th this year! Oh my, I guess all my traveling made me lose track of the date. I suppose I'll have to save some of my Easter craft supplies for next year. LOL These two cards were made using Studio G blank cut out cards. I love how the bunny one turned out because it reminds me of a cake I ate as a child......it was pink with a creamy center and covered with coconut.....called, 'snowball'? Anyway, I ran the pink bunny card through the Xyron machine and then stuck on a blue metallic dewdrop (could be a button) for an eye. Then I covered the bunny with white Flower Soft, the new embellishment sold at Ben Franklin Crafts. 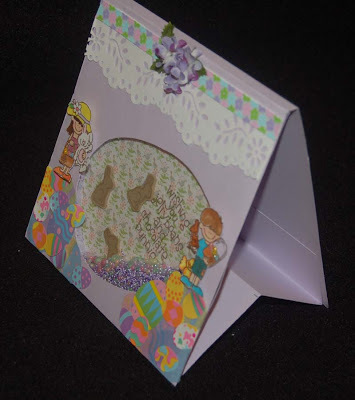 A fancy satin ribbon finishes the look of a yummy bunny cake card. I started the egg card by applying different widths of Merikan tape and covering the sticky surface with various Flower Soft colors. Next I added lines of MS glitter glue and sprinkled them with the new Martha Stewart iridescent tinsel glitter. Finally, I punched out strips of grass with rabbits and grass with tulips using the MS border punches. I added a bit of glitter to the rabbit and tulips and glued the strips to the egg. The gaps on the egg were filled in with green Flower Soft. Even though the egg card is really gaudy, (LOL) I like the texture, especially the punched strips because they pop out. I think I'll try making one with more glitter and using softer colors. Children would really love making or receiving this card. Probably the Studio G card blanks are sold out by now, but you could easily construct them yourself or make other shapes. A chick covered in yellow Flower Soft might be really cute. I think I'll go make one now. An e-mail blast will be sent out on March 31st to craft club members informing them of an upcoming contest. Check this blog for more information about our Easter contest. As promised, here is the project I made with the Easter egg and butterfly crystal beads I purchased from Ben Franklin Crafts. I was surprised when I took the beads off the monofilament and discovered that they were actually glass beads of good quality. I thought that the egg beads were only heavy plastic, so I was extremely pleased with the value. I've purchased handmade glass beads with cupcakes on them before and paid more for one bead than I did for the whole strand from BFC. Actually I don't think they are supposed to be Easter eggs but don't they look really Eastery? The pink crystal butterflies don't show up well in the photo, but if you look carefully you can see them. I wanted to use the chocolate shop decoration that I bought from the Complete Kitchen in Kahala Mall as a display. Isn't it just too cute? I will put this project on the craft club website (www.bfcraftclub@aol.com) even though I have posted other similar projects because there is one feature of this cell phone strap that is different from the purse pulls I explained before. Okay, that's all for today. 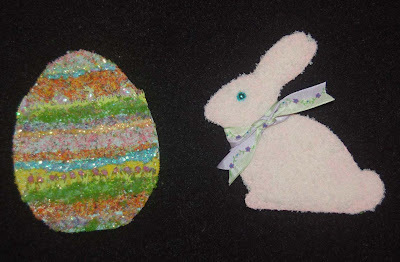 Please visit this blog site again for more Easter craft ideas and information about an upcoming contest. This second photo is a display of some interesting items I discovered while on my last BFC shopping trip. 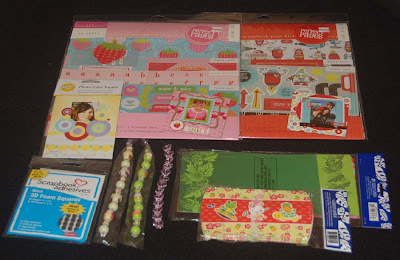 The two scrapbook paper sets are adorable ones 'Little boy' (robots) and 'So Sweet' (girly designs) from Colorbok. Each package has 12x12 papers, chipboard shapes, stickers, and cut-outs. Next I found some cute cupcake decorations from Wilton and I bought the dot design cake topper with photo frame which I thought would be great for a graduation cake. 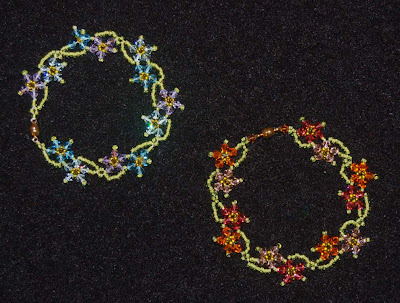 The three bead strands are from a new selection of spring beads. 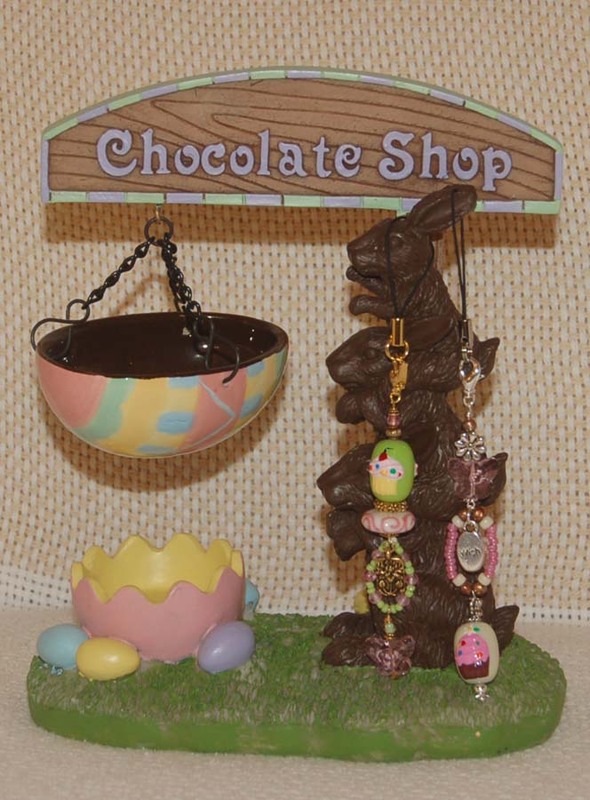 There are lots of colored Easter egg beads with cupcake designs and crystal butterfly strands. I'm trying to come up with a project using these sweet beads. The Sanrio-like designed pillow boxes are something new from Great Lines as are the colorful paper sacks. The pillow boxes and paper sacks (two designs in one package) come in packages of six. Finally, I wanted to show you the adhesive that I used to adhere the boy and girl onto my Easter card. I like this new brand (3L) because there are 217 double stick black square foam pieces (two sizes )in each package. Well, I hope the extra long post makes up for my writing furlough. Oh, I will be posting a contest in a few weeks and there'll be lots of Easter craft goodies given away to a lucky blog reader, so visit often and read your e-mail blast from Ben Franklin Crafts for the exact date. After seeing Brenda's (sweet as a gumdrop) beautiful card, I had to try the format since she so generously supplied the dimensions. With the Martha Stewart scoreboard and Tim Holtz clear ruler (both available at Ben Franklin Crafts), making the card base was not hard at all. I started with an orange 12x12 cardstock (will make two cards) and used a Bo Bunny printed (on both sides) Happy Birthday cardstock for the panels. Using Merikan tape made the work quicker because there was no drying time. The monster, balloon, and word stamps are from a Hero Arts clear stamp set. Because the balloon strings were too thin to cut out I replaced them with black wire. The images are raised up on pop dots which makes them stand out from the busy designs on the cardstock. Although you can't really tell, I glued googly eyes on all of the monsters. This second card is a partially recycled one. Sometimes when I receive a non-handmade card that is too pretty to throw out even after having it on display for months, I cut off the front and attach it to a plain card front. Then I try to dress up the card to make it more personal and send it to someone else. This way I get to be creative, it doesn't take too much time, and I feel good about recycling. 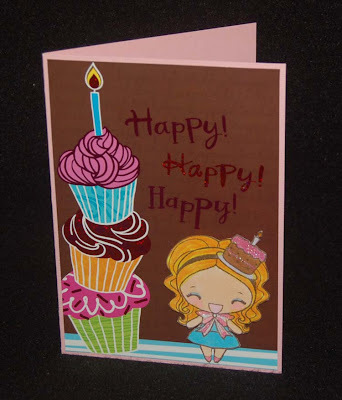 I added the Birthday Anya (The Greeting Farm) stamped image which I colored, cut out, and glittered. Thanks for visiting my blog site. I hope you saw something that made you stay awhile and read about my creations. If you have a blog site, please leave a comment so I can visit you too. If you are a blog surfer like me, I'm sure you are grateful to all the wonderful bloggers who freely share their ideas, templates, and instructions. This project came from Joy (tamikos.blogspot.com). She generously gave the measurements to produce the holder from one 8-1/2" x 11"of cardstock. I'm a little challenged as a paper engineer, but I eventually figured it out so I'm sure you can too. 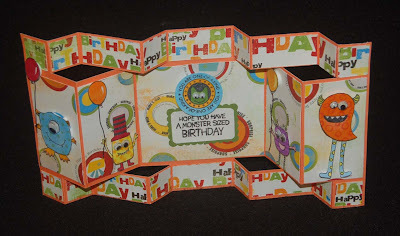 I used the textured paper from the tropical pack of AC cardstock. The printed papers are from K and Co.(poppyseed and greenhouse designs). The topiary was cut from a border (greenhouse) package and the bauble came from the same line. The dimensional flowers and butterfly are (poppyseed) grand adhesion stickers. The girl is a Hero Arts stamp that was colored and cut out. The words with the girl were stamped with a Dandelion Designs rubber stamp. The other two stamped sayings are from a Hero Arts set. 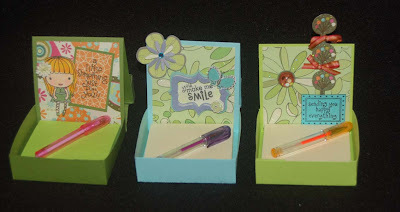 The short colorful pens are from Ben Franklin Crafts. I discovered that the Tim Holtz clear ruler was a great help in doing this project because of the precise markings that go right to the very edge. I just purchased a Martha Stewart scoring board and I think that it would be useful for this project. I'm going to test out the scoring board on my next card project which has lots score lines. Mahalo Joy for your information and generosity in sharing this project with all of us in blogland. P.S. This side view shows you that the clever part of this project is that it holds a spare Post-It pad in the back pocket. What would Easter be without baskets of sweet treats? A quick, inexpensive way to make multiple baskets is to cut them out from paper using a Sizzix die and a Big Shot machine. 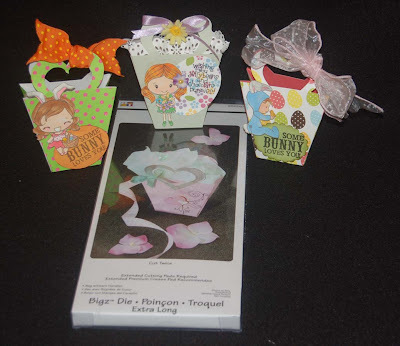 These baskets used the Bigz die (bag with heart handles) and just one 12x12 cardstock sheet per basket. 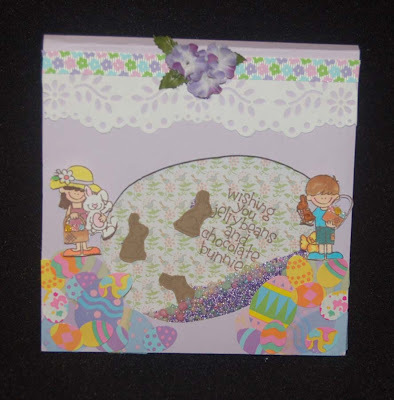 There are lots of rubber stamps with Easter themes available at Ben Franklin Crafts. The basket in the middle has an image from Hero Arts. (The other two are from The Greeting Farm.) If you stamp out all your designs, color them, and then cut them out, you can work assembly-line style to quickly put together baskets for a whole classroom. The lace ruffle in the middle basket was made by using a Martha Stewart jumbo border punch and scrap computer paper. There are lots of 12x12 papers which would make good baskets but the solid embossed basketweave paper (middle basket) looks very realistic when lightly rubbed with ink to bring out the pattern. The word stamps are from Dandelion Designs and Studio G. Oh, the rabbit ears on two of the baskets were embellished with white Fun Flock to give them a fuzzy look. I also sprinkled Martha Stewart glitter and microbeads here and there just because I wanted to play with my new glittery MS sets. In projects to come I will show you ways to use the fabulous MS glitters. Well, that's it for today. I hope that you'll make paper Easter treat baskets and fill them with sweet goodies for all your friends so they'll know that some 'bunny' loves them! Welcome Spring with New Goodies from K & Co.
Sunday shopping at Ben Franklin Crafts was a bonanza of inspiration and goodies. A new line from K and Co. called Poppy Seed is now on display. The 12x12 sheets, grand adhesion stickers, and other embellishments come in a delightful combination of green, blue and lavender. I think you'll love the Poppy Seed collection because the cool restful colors will enhance (not overpower) your paper crafts. But if you love colors that pop and are in a vintage palette, then you'll have to get the yummy stuff from the K and Co. Greenhouse line. These products designed by Carolyn Gavin come with a brown bag label which goes with the natural, organic concept of the collection. My favorite item is the pad of 720 double-sided die cut flowers which you punch out and assemble. In this photo the only non-K and Co. item is the pearl brads from American Crafts. I just thought that the colors of the brads matched well with the Greenhouse colors. 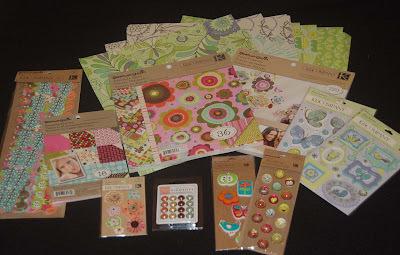 Come back to this site and in the weeks to come I will show you what I make with these fun craft supplies and show you what other delicious new products I found at BFC. For the last few years I've tried to make bracelet leis for graduation. What's a bracelet lei? Well, it's my name for a beaded bracelet that looks like a lei. Graduates often get so many flower leis at graduation time that it becomes a problem to decide what to do with all of them. Especially with many graduates unable to take their leis to grad night, it seems a shame to let them wither and die. For this reason, every year I try to design a new bracelet lei (for the girl graduates) which they can wear to grad night and keep forever as a momento of this milestone in their lives. This year I saw and bought a bracelet at a craft fair, which I thought I could adapt into a bracelet lei. I was able to design something that I was pleased with (see photo) but it was too complicated. Because of the many bracelets I will be making this year I need to keep the design simple. I was going to turn this bracelet into a project, but I don't think I can explain it easily. Anyway this was what I was struggling with for a few days. I think I'll go back to paper crafting for awhile until I can come up with a new bracelet lei design. Thanks for visiting this blog site today. Come back soon. I recently had some eye surgery and now my vision has been restored to pre-college status. I can't believe how much I've missed over the years. With my new eye I've been happily coloring and crafting some new products. 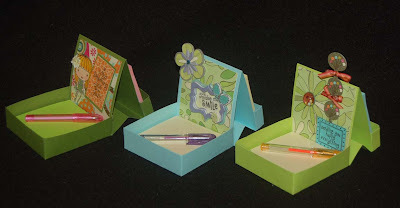 These items are something different for me and a refreshing change from card making. I especially like the idea that the recipient will keep my work unlike cards which may get tossed aside. I used The Greeting Farm rubber stamps, cut out the colored images and raised them up on pop dots. Be sure to use waterproof ink to stamp your images if you are going to color them with markers. The checkbook background paper is from Darby, the bookmark paper is from the Once Upon a Time DCWV paper stack, and the two luggage tag papers are from the Travel DCWV paper stack. The suitcases on the luggage tags are stickers. It's easy to assemble a bunch of these items if you rubber stamp, color, and cut in factory fashion. 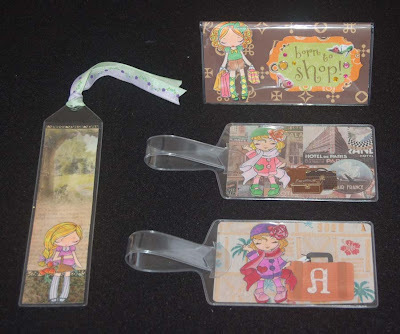 I'm planning to use one of the luggage tags as a thank you card to my sister. I will write my note and slip it behind the tag and put the whole thing in an envelope. The same thing could be done with the bookmark and checkbook cover. Maybe you could put the bookmark in a gift book and put a gift card in the checkbook cover as an added gift. Undecorated tags, checkbook covers and bookmarks will be sold on our website http://www.bfcraftclub.com/ in the online store.